This lesson describes the physical processes, both natural and human-induced, that lead to changes in sea level. The processes described include climate induced changes in ocean heat content and volume, natural oceanic cycles, and both natural and human-induced changes in coastal land elevation. The learning is enhanced with rich graphics and periodic questions. Very Helpful, Easy to follow. Easy to understand and navigate. A great for beginners. Read it slow and read it again. It's a decent review website. I wish the material was a little better to read and that the answers to the tst wer ea little bit more clear. Some parts were complicated and required re-reading a few times to fully understand the meanings. Great information. Unfortunate that it is such a polarized subject with abundant misinformation abound. Did not open lesson, went directly to quiz. I was not able to understand a question, maybe its me, maybe not, anyway I wanted you know just in case (about antropogenic vs. natural cycle effects). La lección me ha parecido excelente, la información gráfica y los datos presentados realmente muestran como este fenómeno físico se está presentando en la mayoría de los ambientes dinámicos de nuestro planeta. me ha servido de mucho y sin duda alguna compartiré esta lección a mis alumnos. gracias por la valiosa información. es un placer aprender cada día más de la ciencia. Beside the score, right answer must be displayed. Without it quiz takers knowledge about oceanography will not enhance. i am retired and thus my earth science degree pretty old. This was a good refresher and updater of my basic knowledge of oceanography. 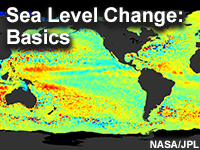 Describe why projections of sea level change are important for coastal projects.